If you’ve bought a pair of headphones for your computer and spent more than $50 or so, you’re probably not hearing those headphones perform to their potential. This is especially true if your headphones represent a substantially higher investment. While the headphone jack and associated audio circuitry found in most computers work fine, those components were likely chosen to meet specifications related to power, space, and cost, rather than for their audio performance. Two primary components of a device’s audio circuitry determine how that device sounds and how well it works with a set of high-quality headphones. The first is the digital-to-analog converter (DAC), which takes a digital audio signal—say, one provided by your computer’s software—and converts it from digital data to an analog electrical signal that represents recorded audio waveforms. The second is the device’s headphone amplification circuitry, which takes the analog waveform and amplifies it so that it’s sufficiently powerful to drive your headphones to volumes suitable for listening. An upgraded DAC pieces the digital signal together into a more-accurate representation of the original analog signal, and it also isolates the easily-distorted analog signal from the electrically noisy environment of your computer, giving a cleaner signal. An improved headphone amplifier, on the other hand, helps ensure that the amplified signal accurately reflects the decoded analog data; provides more power for power-hungry headphones; and provides more exacting control of the headphones’ mechanical movements due to electrical characteristics such as damping factor. Headphone geeks have long used external headphone amplifiers to get the most out of their headphones, but with the rise of computer audio, a variety of headphone amplifiers and digital-to-analog converters are available in small, computer-friendly packages. Macworld has previously reviewed higher-end units such as the $649 Headroom Micro Amp and Micro DAC (4.5/5 rating) and the DAC-only Cambridge Audio DacMagic (4.5/5 rating; $429 when last available). While these models sound great, they’re overkill for less-expensive headphones. 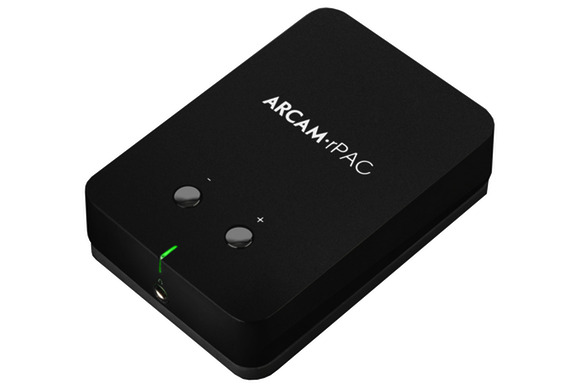 Arcam’s $249 rPAC USB DAC/Headphone Amp, a member of the company’s rSeries line of entry-level consumer gear, combines an external USB DAC with a dedicated headphone amplifier in a small package—and at a price far below most similar audiophile-grade products. Arcam (short for A&R Cambridge) has a long history in hi-fi. I first became aware of the company years ago, when one of the company’s home-theater receivers was lauded as being the best available at any price. However, the company is particularly notable for shipping the first stand-alone DAC for consumer audio use, the Black Box, which served to upgrade the sound of early CD players. The rPAC—the PAC stands for Personal Audio Converter—is itself a black box, and a relatively small, portable one at that: It’s just a bit bigger than a deck of cards at 4 by 2.5 by 1 inches. In front, the rPAC features a 3.5mm headphone output, while the back features a USB type-B plug for accepting digital audio and power from a computer, as well as an analog stereo-RCA output for connecting the rPAC to a set of computer speakers or a full-size stereo system. (Oddly, plugging in headphones does not mute the RCA outputs, so if you have computer speakers connected to the rPAC, you’ll have to manually mute them when you listen to headphones.) The rPAC handles digital audio via USB up to 96 kHz, 24-bit. The rPAC’s top has two buttons for volume control (pressing both at the same time mutes the unit, while pushing either un-mutes), and a status LED that wraps around to the front of the unit. The LED glows green when music is playing, red when no signal is detected, and amber when the unit is muted. The bottom of the rPAC has a rubbery texture that helps keep it in place on your desk, while the rest of the rPAC is finished in a staid, matte black (which did pick up some minor scuffs over the course of my testing). In addition to the rPAC itself, the surprisingly heavy package includes a USB cable, a stereo RCA cable, and a velour, drawstring carrying pouch. It turns out that the package feels heavy because the rPAC itself is surprisingly hefty at 11 ounces—about the same weight as an iPad mini. With those 11 ounces concentrated into 10 cubic inches, the rPac feels remarkably solid. Heft is generally a desirable trait in audio gear, where it indicates solid construction and quality components; an Arcam representative attributed the weight to the rPAC’s cast-aluminum body, extensive radio-frequency shielding, and “a brick in the bottom”—that last part was, presumably, a joke, but the rPAC does have an almost brick-like heft. If you’re interested in the rPAC’s DAC features, but not its headphone amplifier, the company offers three other rSeries DACs without headphone outputs. The $249 rLink swaps the rPAC’s USB inputs for optical and coaxial digital inputs for use with stereo components, an Apple TV, or an AirPort Express. Alternately, the company’s upcoming rBlink, which removes the rLink’s wired digital inputs and replaces them with a Bluetooth receiver for wireless audio, is the same price. The larger, $479 rDAC has USB-, optical-, and coaxial-digital inputs, and offers an even higher-quality DAC. As with most USB DACs/amps, using the rPAC is simple. Just plug in the USB cable and headphones—I primarily used my reference $499 AKG K 701, which I’ve found to do a good job of resolving differences in audio sources, and to be picky about the quality of the amplifier driving it. I also used the rPAC with a number of in-ear headphones that I have on hand. The overall effect of upgraded audio electronics can be hard to describe. As with many DAC/amp combos I’ve used, the rPAC puts music against a “blacker,” more-silent backdrop; puts individual sounds into sharper relief, better separating them from other sounds; resolves more detail and instrumental texture; tightens up bass response (particularly with demanding headphones such as the K 701); and gives the music a better sense of momentum. These may sound like small differences, but they add up, and the most noticeable (and practical) difference I found with the rPAC is that when I was using it, I didn’t want to stop. While the rPAC improves my Mac’s audio performance in ways that I can pick apart, more important to me is that it makes listening more fun than with any other DAC/amp I have on hand, and it gives me the best headphone sound I’ve heard since I returned my review sample of HeadRoom’s Micro Amp and DAC. Although I’m hesitant to make detailed comparisons to a component I last heard over a year ago, the rPAC is compelling enough that, depending on your headphones, it may be all the DAC/amp you need, despite its relatively low price. Speaking of HeadRoom, the company’s $149 Total BitHead has been my go-to DAC/amp for about five years now—but it hasn’t seen much use since the rPAC arrived. The BitHead is still pretty good, particularly considering its age, but the rPAC’s sound was noticeably cleaner, musical pace and momentum was better with the rPAC, and the AKG K 701’s bass performance suggested it was driven by a better headphone amplifier. The rPAC was simply more compelling overall. The BitHead does offer a few more features compared to the rPAC, including dual headphone outputs, low/high gain modes for more-precise volume control, an analog input, and a crossfeed circuit that can provide more-natural sound with some recordings, although the BitHead lacks the rPAC’s RCA outputs. Audioengine’s $169 Audioengine D1 Premium 24-bit DAC (slated for future review) was, for a couple of months before the rPAC showed up, a frontrunner to replace the BitHead. In direct comparison, the D1 seems to boost treble and bass a bit over the rPAC—I believe the rPAC’s sound is more neutral—and the rPAC definitely presents better instrumental textures, gives music a better sense of momentum, and has a cleaner, clearer overall sound. On the other hand, the D1 offers an optical-digital input that allows it to pull double duty as a DAC for stereo components or AirPlay use. I also compared the rPAC to the $429 Cambridge Audio DacMagic that serves as my reference DAC in my full-size stereo system. The rPAC is a capable DAC beyond headphone use, so I compared the two as sources in my stereo. I expected the DacMagic, as the more-expensive component (and one not designed for double duty), to outperform the rPAC, but what I didn’t expect was my strong preference for the DacMagic. In direct comparison, the rPAC sounded slightly muddy; the DacMagic conveyed a stronger stereo image, crisper high frequencies, more-natural vocals, and tighter bass. Still, if you’ve got a nice stereo system, but you’re not currently using an external DAC, the rPAC will likely represent a nice upgrade—but it shines most brightly when used with headphones. Similarly, although the rPAC’s headphone performance may be its primary draw, if you’ve got very good computer speakers and you’re listening to them through your computer’s analog audio output, prepare to be surprised by what they can really do through the rPAC’s RCA outputs. The rPAC supports files up to 96 kHz, 24-bit (i.e., better than the CD-quality 44.1 kHz sample rate and 16-bit depth). While I’m not sold on the benefits of high-resolution digital audio files, I tested the rPAC’s support with some 24/96 recordings (in Apple Lossless format, as with most music I use for testing purposes). The rPAC played them back, as expected. I did thoroughly enjoy listening to the high-resolution recordings, although it remains difficult for me to say whether they’re sufficiently better than their CD-quality counterparts to justify the hassle of finding and managing additional music files. I believe most listeners would need equipment upgrades to resolve audible quality improvements in high-resolution music, if such improvements are perceptible. For many listeners, $249 is expensive, but the rPAC is reasonably priced within the hi-fi world, and it performs incredibly well for the price: If you plug some nice headphones into the rPAC and put on a favorite album, you probably won’t want to stop listening; if you have headphones that cost as much as the rPAC or more, the rPAC will reward your investment. If you have less-expensive headphones, you might be better served by a less-expensive DAC/amp, or by saving up for a headphone upgrade. But for me, the rPAC has replaced my long-time reference DAC/amp, and I plan to follow my own advice and buy one for myself.